This page has been recovered via web.archive.org. Formatting is not ideal at the moment, but it's on our list; we'll get to it eventually! Note 1: Mixed teams play 4-3 or 3-4 with receiving team deciding gender ratio. Note 2: Juniors players must be 19 or under on December 31, 2002. Juniors teams play 4-3 or 3-4 with receiving team deciding gender ratio (exceptions will be allowed). Note 3: Juniors Division will be SATURDAY ONLY. Juniors teams wanting to play both days, will be combined with the Mixed B Division on Sunday. Hotels/Camping See www.toronto.com for additional info. Last update April 7, 2002 (thanks to Jay Ladell)! TUC has negotiated special rates at the following hotels for the weekend of TUT 2002 on the nights of May 3rd and 4th. You must reserve at least two weeks in advance and refer to the Toronto Ultimate Tournament for the special rate (prices do not include 12% tax). The drive time to both the playing fields (first) and downtown Toronto (second) are listed in brackets. Continental Residence & Conference Centre (formerly a Howard Johnson), Annie Sunich 416-438-2216, asunich@campuslivingcentres.com (Markham & Hwy. 401, 20mins/45mins) - Room for 3 or 4 with two double beds - Continental breakfast, fridge & microwave, free parking. $69.95 per night. Seneca Residence & Conference Centre, Annie Sunich 416-438-2216, asunich@campuslivingcentres.com (Finch & Don Valley Pkwy., 10mins/35mins) - Two bedroom suite for 3 or 4 with two double beds - Common kitchen area, $5 for parking. $79.95 per night. Scarborough Inn 416-299-7999 (Sheppard & Kennedy, 15mins/35mins) - Room for 3 or 4 with two double beds - Basic. $70 per night (are not offering a special TUT rate, but are reasonably priced and close to the fields). Travelodge Toronto East 416-299-9500 (Markham & Hwy. 401, 20mins/45mins) - Room for 3 or 4 with two double beds - Continental breakfast, pool, health club, free parking. $80 per night. Quality Inn Toronto East 1-800-714-7496 (reservations) or 416-293-8171 (Warden & Hwy. 401, 20mins/30mins) - Room for 3 or 4 with two double beds - Continental breakfast, pool, free parking. $95 per night (quote group number 5239 for special rate). Holiday Inn - Don Valley 416-446-3700 (Don Valley Pkwy. & Hwy. 401, 20mins/25mins) - Room for 3 or 4 with two double beds - Pool, sauna, whirlpool, fitness centre, free parking. $109 per night. Holiday Inn - Markham 905-474-0444 (Woodbine & Steeles, 10mins/35mins) - Room for 3 or 4 with two double beds or one double and a pullout sofa - Pool, sauna, whirlpool, free parking. $120 per night. Camping - Indian Lake Campground 905-678-1233, 1-800-304-9728 (Finch & Hwy. 27, 50mins/50mins) - Campground opens for the season on Apr 27. Fees are $21,25,29 for 4,5,6 people at a site w/o water & electric; $26,30,34 for 4,5,6 people at sites w/ water & electric. The tournament has outgrown Milliken Mills Park. We will play at a number of locations, but all are within 2-3 miles of Milliken Mills. Frisbee Central: Milliken Mills Park is between Warden and Kennedy on the south side of 14th Avenue in Markham. There are 5 soccer fields (10 Ultimate fields with some inappropriate lines and soccer goals) and 5 ball diamonds in the park. Father McGivney High School. NE corner of McCowen and 14th Avenue. From Frisbee Central: go east along 14th Avenue to McCowen (about 2 KM). Coppard Glen Park. South side of Highglen east of McCowan. From Frisbee Central: go east along 14th Avenue to McCowen (about 2 KM), continue east to first right, go south to Highglen Ave (first stop sign), go east for 1/2 block, field is on right. Middlefield High School. South side of Highglen east of McCowan. From Frisbee Central: go east along 14th Avenue to McCowen (about 2 KM), continue east to first right, go south to Highglen Ave (first stop sign), go east for 1-1/2 blocks (past Coppard), school is on right. Markham District High School. South side of Church between Markham Road and Wooten Way. From Frisbee Central: go north on Kennedy to Hwy 7, then east on Hwy7 to Markham Road (= Hwy 48, about 4K), continue east to Wooten Way (about 1K), go north on Wooten Way to Church, and west on Church for 1/2K. From Highway 401: go north on Markham Rd (=Hwy 48) to Hwy 7, then east on Hwy 7 to Wooten Way (about 1K), north on Wooten Way to Church, and west on Church for 1/2K. From Highway 404: go east on Hwy 7 to Markham Rd (=Hwy 48, about 8K), continue east on Hwy 7 to Wooten Way (about 1K), north on Wooten Way to Church, and west on Church for 1/2K. There are six Ultimate fields here - two in the track, two south of the track, and two behind the school to the south and west. Mintleaf Park. North side of Fincham Road. From Markham District High School: go east on Church to Wooten Way, go north on Wooten Way until it dead ends at Fincham Road. Park is in front of you on the right. Fincham Park. North side of Fincham Road. From Markham District High School: go east on Church to Wooten Way, go north on Wooten Way until it dead ends at Fincham Road, go west on Fincham Road to first stop sign (~3 blocks), Park is on the right. 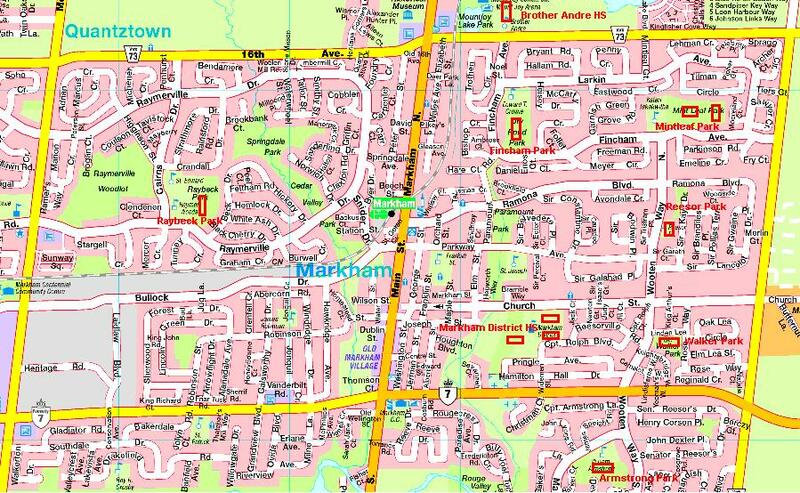 If we need any other fields, directions will be available at Milliken Mills Park and Markham District High School. There will be no captain's meeting. All the info you need should be here. All games will follow UPA 10th Edition Rules with the exceptions listed below. There are 6 time slots on Saturday - please stay on schedule! Sunday's games will be staggered a bit to allow for games in each division to finish in time to watch their respective finals. Saturday games will be to 13(17), half at 7(9), win by 2, hard cap at 15(19), with one time out per team per half. Start times will be between 09:00 and 16:15. Saturday soft caps will be at 75(90) minutes after the scheduled start time, these times are set in stone; if you start late you still finish on time. Sunday games will be to 15, half at 8, win by 2, hard cap at 17, with one time out per team per half. Start times will be between 10:00 and 16:00. Sunday soft caps will be at 90 minutes after the scheduled start time, these times are set in stone; if you start late you still finish on time. (Except for Open, Womens, Mixed championship games) At the soft cap, finish the current point (note that the current point begins when the previous point is scored). After that point, if one team has won by the regular rules, then game is over; otherwise game goes into "overtime". For overtime, add one (1) point to the highest score and play until one team reaches this score. There are no timouts allowed in overtime. For the Open, Womens & Mixed championship games: at the soft cap, finish the current point (note that the current point begins when the previous point is scored). After that point, if one team has won by the regular rules, then game over. Otherwise, the game goes into "overtime". The hard cap for overtime will either be 17 OR 2 more than the highest current score, whichever is smaller. Game continues until one team reaches 15 or higher with a margin of at least two or one team reaches the hard cap. There are no timouts allowed in overtime. Between Points: After a point is scored, the receiving team should be ready within 75 seconds and the pulling team should pull within 90 seconds. Timeouts: Timeout calling team should be setup within 105 seconds of the time out call, other team should check the disc within 15 seconds after the offense is set. Half Time: Receiving team should be ready 4 minutes 45 seconds after the start of half time. Pulling team should pull within 5 minutes of the start of half time. Foot Blocks. Attempted foot blocks by a marker within five feet of a thrower are illegal (treated like a foul against the marker) unless captains agree otherwise before the game. 10th Edition Pull Rules (eg live endzones) will be in effect. Since fields are a little short, the brick mark will be fifteen (15) yards from the goal line. Score Sheets. Each team will have one score sheet for each day. Please make sure the game score AND Spirit score are recorded for every game you play and that your sheets are turned in to a tournament official as early as possible on Saturday and before you leave on Sunday. Teams that do not turn in ALL their scores in 2002, might be refused entry to TUT 2003. NOTE: Spirit of the Game is to me the most important part of Ultimate. Spirit Scores for TUT run between 0 and 5 (decimals allowed) with 5 being reserved for the best Spirited teams. The best way to determine a score for your opponent is for the team to stand in a circle, and each player to use the the fingers of one hand to give their opinion. An approximate average should be reported. Spirit rankings are highly subjective. To make them a bit standardized, I would ask that everyone start with a score of "3" for a team with "average" spirit. The TUC has some guidelines that might help you if you haven't assigned Spirit Scores before - Click here. Dinner at Milliken Mills from 17:00-20:00. Party will be at North Beach again this year (see below). I have already dropped off the "Cups" equipment, so you will be able to start playing whenever. From Milliken Mills, Father McGivney HS, Coppard, or Middlefield HS: go east on 14th Avenue to 9th Concession Rd (east of Hwy 48), go north on 9th Concession to Church St (north of Hwy 7). 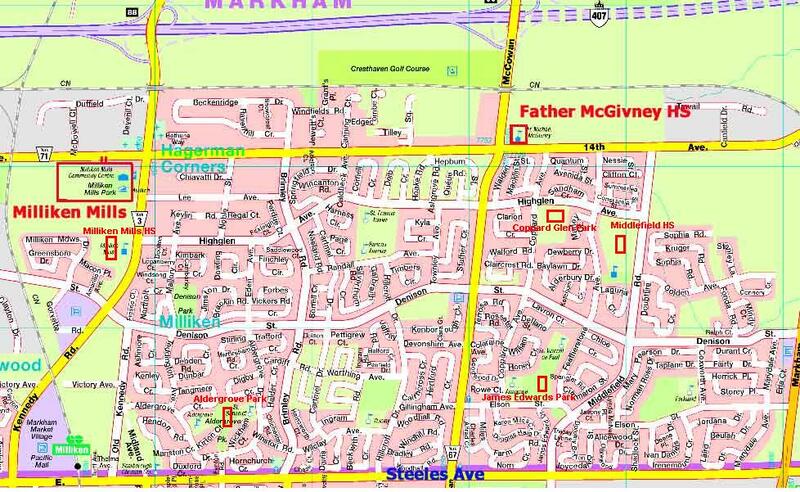 From Markham District HS, Mintleaf Park, Fincham Park: go back to Church Street, go east on Church (~3 blocks). Saturday games are to 17, half at 9, win by 2, hard cap at 19 and will start at 10:30, 12:30, and 16:00. Each team is allowed one time out per half. Halftime lasts 5 minutes. The soft time caps will be at 12:00, 14:00, and 17:30. These soft cap times are SET IN STONE - if you start late, you still finish on time! At the soft cap, complete the point. If the game has not been won, game goes into "overtime": add one point to the higher score and play until one team reaches this score. There are no time outs allowed in overtime. 1. Record among the three teams. 2. Point differences among three teams. 3. Points "for" among the three games. 4. Point differences in all games. 5. Points "for" in all games. Saturday games will be to 13, half at 7, win by 2, hard cap at 15 and will start at 9, 10:45, 12:30, 14:30, and 16:15. Each team is allowed one time out per half. Halftime lasts 5 minutes. The soft time caps will be at 10:15, 12:00, 13:45, 15:45, and 5:30. These soft cap times are SET IN STONE - if you start late, you still finish on time! Saturday games will be to 13, half at 7, win by 2, hard cap at 15 with start times at 9, 10:30, 12, 1:45, 3:15, and 4:45. Each team is allowed one time out per half. Halftime lasts 5 minutes. The soft time caps will be at 10:15, 11:45, 1:15, 3:00, 4:40, and 6:00. These soft cap times are SET IN STONE - if you start late, you still finish on time! Note: T1 vs T4, T2 vs T5, and T3 ve T6 are never played. 1. If they played each other, Head-To-Head. 3. If still tied, point differences for all games. 4. If still tied, points "for" in two games from 2. 5. If still tied, points "for" in all games. 6. If still tied, flip discs. If they didn't all play each other, Label them as X, Y, Z, where X played Y and Z, but Y and Z didn't play. Consider the team W (that didn't play X). 1. If W is seeded below X,Y,Z, then X wins the tie break. 2. If W is seeded above X,Y,Z, then X loses the tie break. 3. After determining where X lies, the tie between Y and Z is broken as in the two team tie break. Four team tie break - Gimme a break! Juniors games will start at 10:00am and will finish by 5:00pm on Saturday. Juniors players are encouraged to stay for dinner at 5:00pm. Schedule will be distributed at the site. Open Division A (10 teams). Seed Team City Captain Paid? Open Division B (12 teams). Mixed Division A (10 teams). Mixed Division B (12 teams). Juniors Division (4 teams, Saturday only, interested teams can join Mixed B div on Sunday). The party will be at North Beach Volleyball Academy (5 indoor sand courts, two cash bars, pool table, ping pong, videos of Saturday's games, Frisbee cups, etc) at 74 Railside Road. Directions: From Hwy 401 & Hwy 404, go south on Hwy 404 to Lawrence (third exit), go east on Lawrence to second Railside Rd (second light), go south on Railside to North Beach (on right, parking at back). You are welcome to head there immediately after the dinner at Milliken Mills - no need to shower, you'll be playing VolleyBall and/or Frisbee Cups anyway, and there are showers at North Beach.